“I think I pissed off Elder Maxson” edition. The Brotherhood of Steel have better resources. They use Military-Grade Duct Tape instead of regular. And also because there is a glitch in my game where Caretaker hangs out at Abernathy Farm instead of Mercer Safehouse (Outpost Zimonja in this instance). Fun fact: Ingram and Maxson walk instead of taking a vertibird. Another fun fact: The pathfinding AI hasn’t come that far since Oblivion (Hieronymus Lex had all the pathfinding abilities of a first-generation Roomba on his journey to Anvil) – Maxson and Ingram get stuck on the bridge before coming up to County Crossing. So I targeted Maxson in the console and teleported him a little bit further so he could continue. I wanted to see him in action. I was going to follow him the entire way. We were barely even attacked. The first attack came at County Crossing. I barely got to fire a shot because the cluster of Heavy Laser Turrets put on quite the laser show and then it was over. We were attacked by a few glowing dogs near Greentop Nursery. 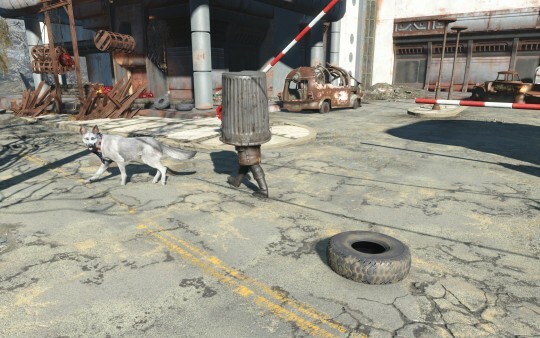 Coming up to the Malden area, I started to think.. “the elder really should be better protected than his 50 ballistic resistance battlecoat” and that’s when I saw the trash bins scattered about. I couldn’t resist. So we went on that way for a while. I amused myself further by trying to stack tires and road cones on top of the trash can, but he couldn’t keep them on for long. The trash bin fell off a couple of times, particularly going uphill. After the third time, I stopped bothering trying to put it back. The last stretch isn’t a particularly dangerous one. I can probably setstage myself past this hitch. 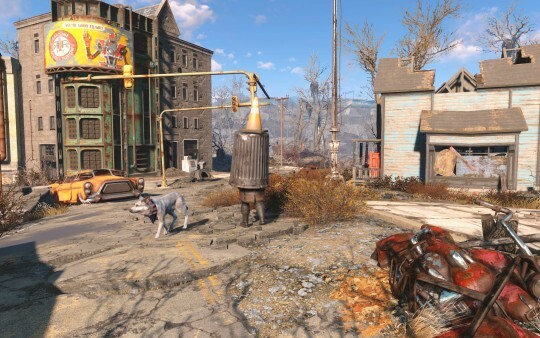 Tried going on a scavenging run over to Nuka World in case I just needed to enter a different worldspace to set things straight – the fine folks at Bethesda probably didn’t expect someone to do this..
but he still won’t talk to me. I bet the real reason he never sleeps is so you can’t Sandman kill him either.